Take pleasure in watching movies, TV shows, and home videos on your widescreen Apple TV without any more restrictions. mediAvatar Apple TV Converter supports almost all HD and common video formats like AVI, MPEG, WMV, RM, RMVB, MOV, MKV, etc., with just one click you can convert different video formats to Apple TV H.264 HD, MP4 (MPEG-4, H.264), FLV and MOV videos for playing on your Apple TV, and also convert video/audio formats to MP3, AAC, WAV, AIFF, M4A audio files compatible with Apple TV. 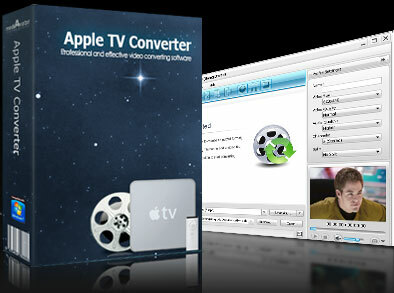 Enrich your Apple TV media library with mediAvatar Apple TV Converter from now on! Almost all HD/SD video formats can be converted to Apple TV MP4 video, FLV and MOV video, e.g. convert AVI, MPEG, WMV, RM, RMVB, MOV, MKV, 3GP to Apple TV MPEG-4 video, or to Apple TV music files in MP3, AAC, WAV formats. Convert all popular audios like MP2, MP3, WMA, WAV AAC, AC3, AIFF and OGG to Apple TV MP3, AAC, WAV, AIFF and M4A audios. The support for batch process and multithreading promotes the video to Apple TV conversions greatly and efficiently. By introducing NVIDIA® CUDA™ and multi-core CPU processing technology, mediAvatar Apple TV Converter provides you with super high speed to convert videos to Apple TV movies. To create custom files, mediAvatar Apple TV Converter provides you with rich adjustable output parameter settings like video/audio quality, channels, bit rate, frame rate, etc. Save time by assigning several different output file formats from one source file. Clip a certain video segment by choosing the start and end time of the certain clip. Getting video file converted in exact size is an easy thing now with the smart Bitrate Calculator tool in this Apple TV video converter. With the bit rate calculator, indicate the file size you want and let the smart tool do the job for you. Split a file into several small parts by a given file size or clip duration. Preview your edited videos with the built-in player; take snapshots of scenes you like and save as picture file. Running the software in background can save computer resources and let users attend to other tasks without conflict.